Apple now implements Intel processors in the successors of the iBooks and therby accomplished the transfer to PC technology. 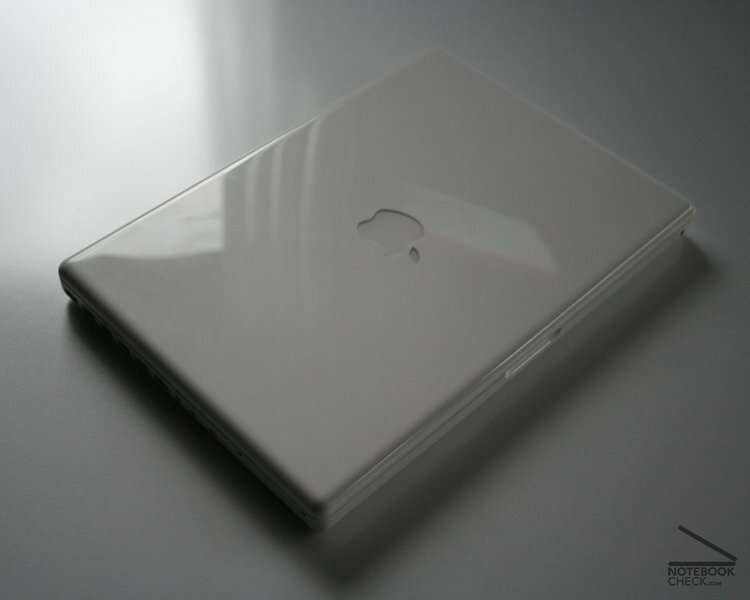 Whether this transfer was successful and how the technology, which is new for Macs, harmonizes with the white Macbook can be learned in our detailed review. The entrance model got a compact completely white case, is well finished and hardly tortions with pressure. 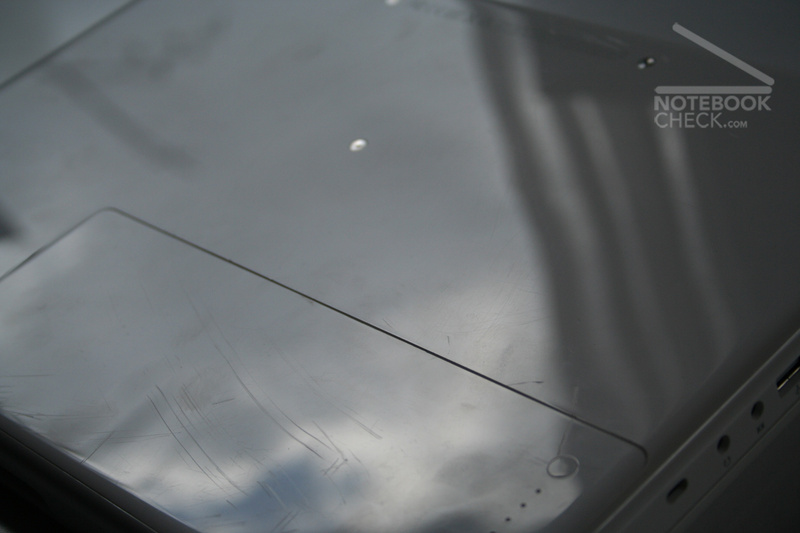 However the exterior sides of the case arre quite scratch sensitive - on our test sample already there were some scratches. 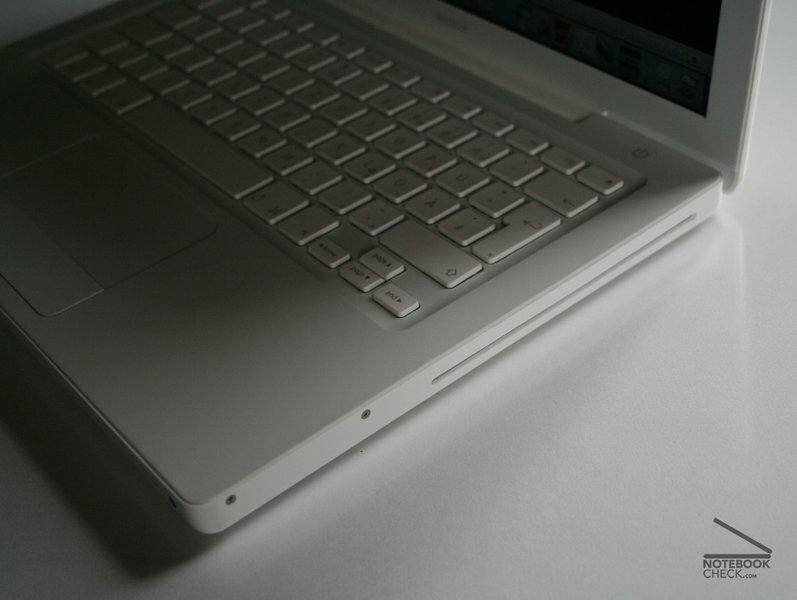 The top model of the MacBook series is manufactured in tarnished black and possibly somewhat less scratch-sensitive. 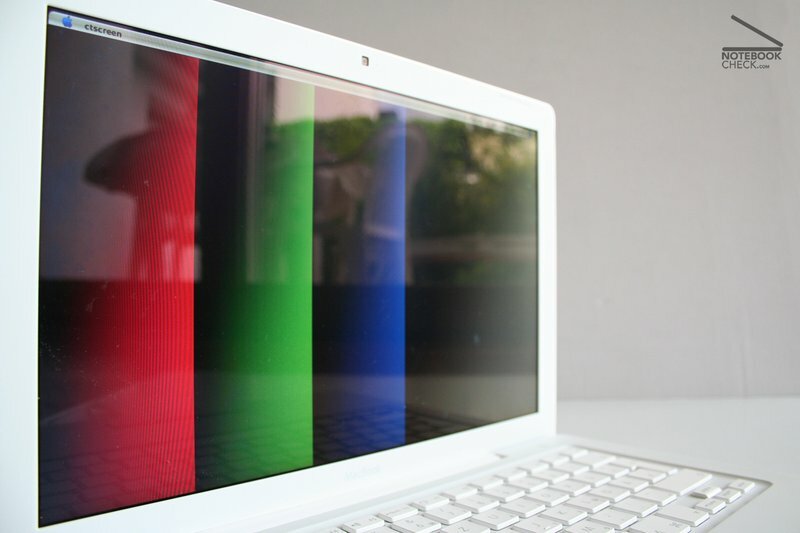 The design of the laptop pleases at first view. 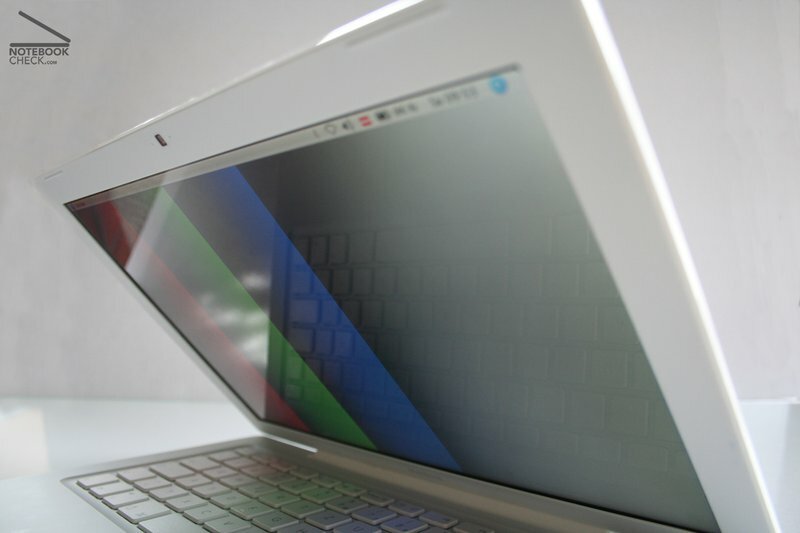 Particularly the intelligent arrangement of the fan exit on the back of the notebook, the absence of any openings on the bottom and the loudspeakers reflecting on the display are positive features. The integrated iSight camera for video conferences functions perfectly, but rushes strongly with insufficient brightness. 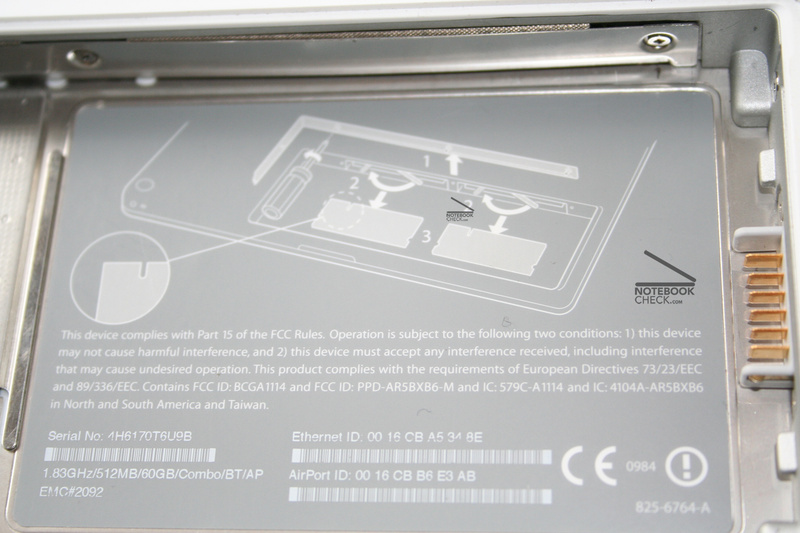 A negative aspect is, that one of the feet is implemented in the battery. 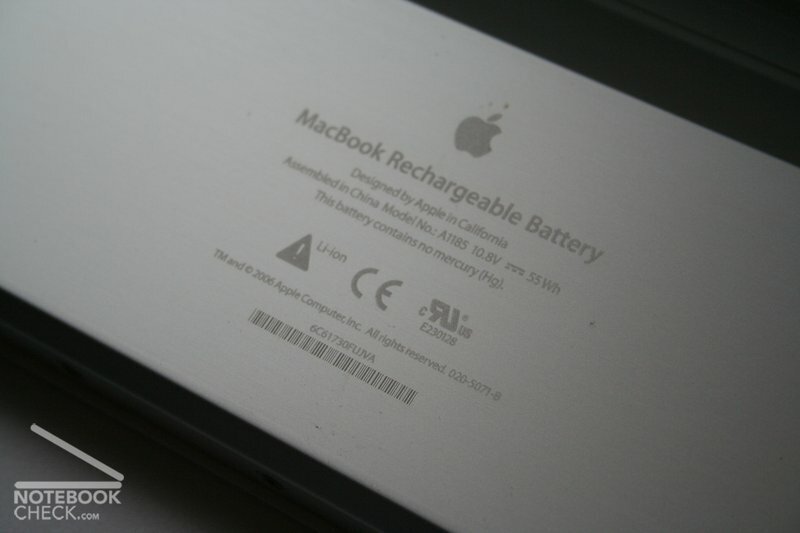 With disconnected battery the MacBook stands not stable. Nonetheless the feet are stronger and therefore more stable than with the iBook. 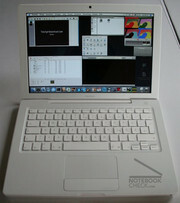 All connection options of the iBook successor are on the left side (ergonomic for righthanded people). 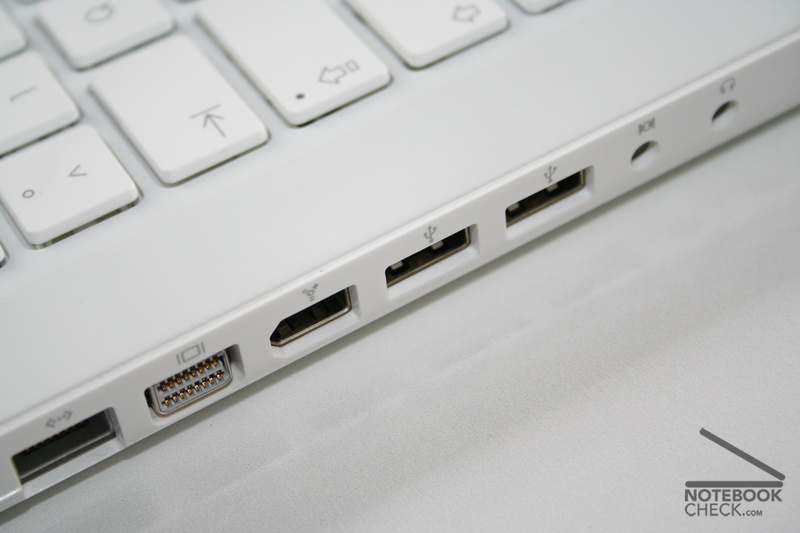 As like the large brother, the MacBook Pro 15", the MacBook offers only two USB 2.0 connections. The monitor exit is implemented as Mini-DVI-D (for saving space) and only can be converted to a DVI-D or analogue monitor-exit/TV-out of normal size by an adapter, which costs approximately 20 Euro. This adapter is not included! 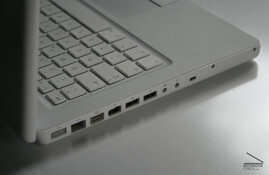 Further connectionoptions are digital sound entrances and exits, a FireWire 400 port and a Gigabit LAN connection. Other manufacturers usually offer more USB and a Cardreader. The lack of an infrared port is to be criticized. The existing one is unidiretional and only appropriate for the remote maintenance). Bluetooth 2.0 is included with the small sub-notebook. 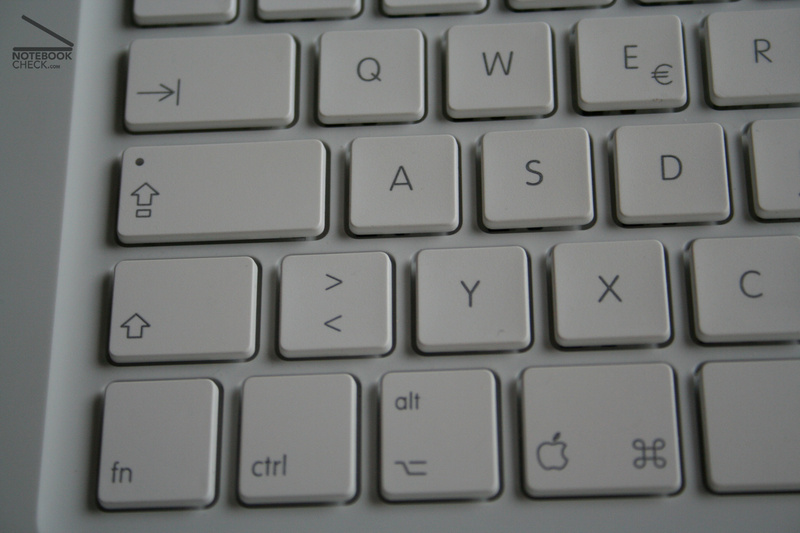 The keyboard of the MacBook offers pleasantly large keys and a normal key distance. Both is not common in this class of laptop size. The keys lie somewhat wobbly in the chassis and sometimes jingle with the pressure. 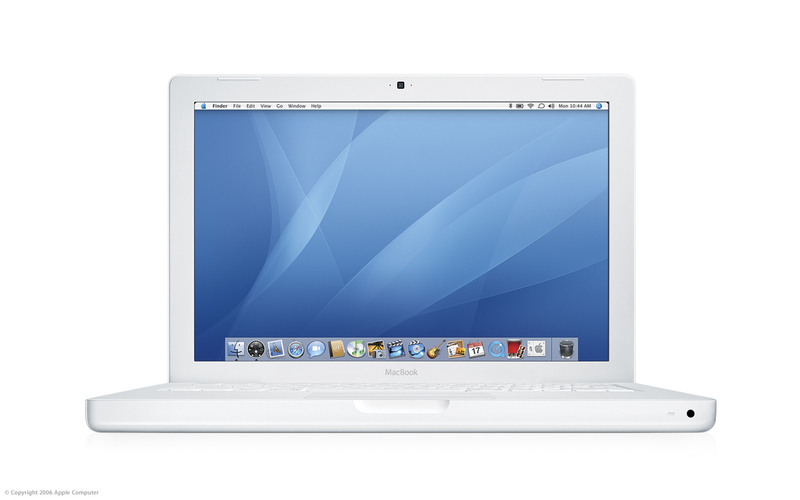 The pressure point is well noticeable and the layout is elaborated well for Macusers. 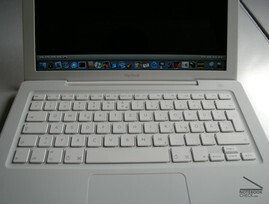 Generally it is very pleasant to write with the keyboard, though it can't achieve the quality of MacBook Pro completely. 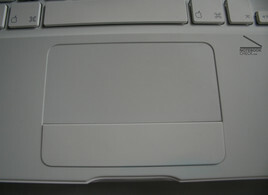 The broad scrolling trackpad (that's how Apple calls a touchpad) can be handled pleasantly and reacts precisely to inputs. 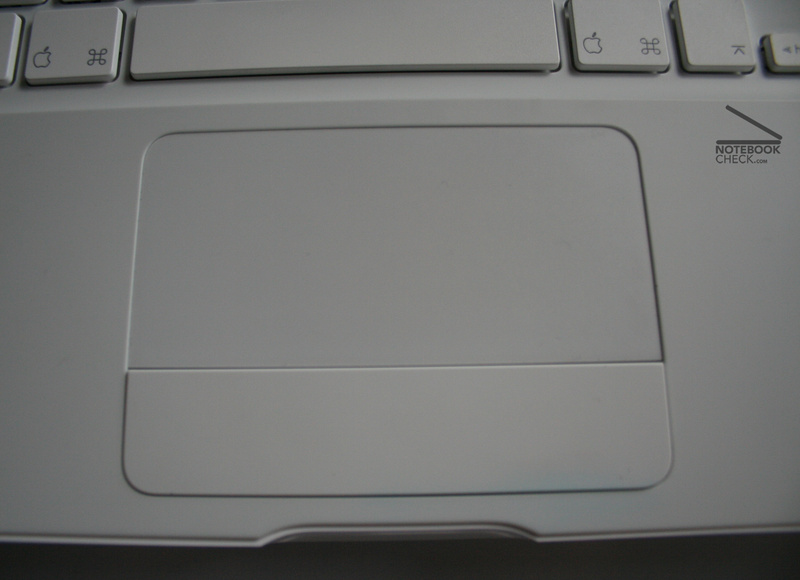 The special functions (scrolling and right-click with 2 fingers) work well as usually and the widescreen format of the touchpad supplies a welcome increase of navigation area. Tip: In order to be able to accomplish a right mouse-click fast, it is possible to keep 2 fingers on the touchpad and press the mouse key. However first this must be adjusted in the system attitudes in the menu "keyboard & mouse" - "trackpad" - ". 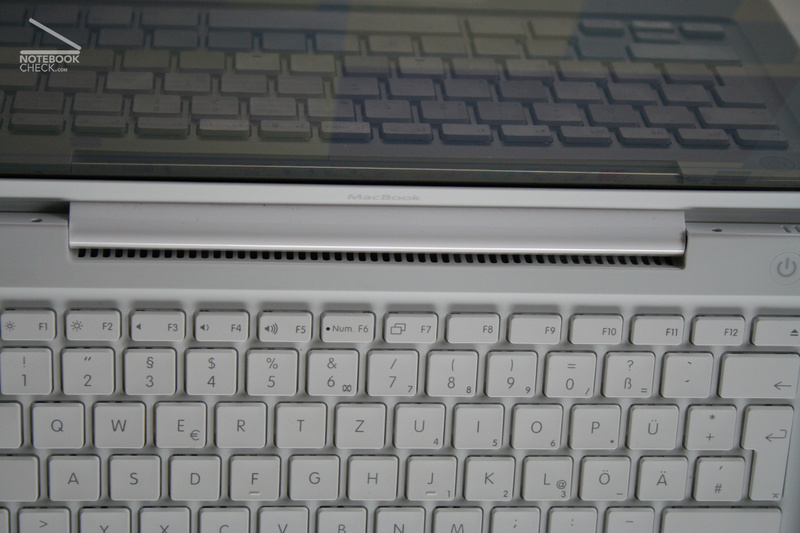 Set two fingers on the trackpad and press the trackpad key to make a secondary click. Further an infrared remote maintenance "Apple Remote" is added to the MacBook, with which FrontRow can be attended. 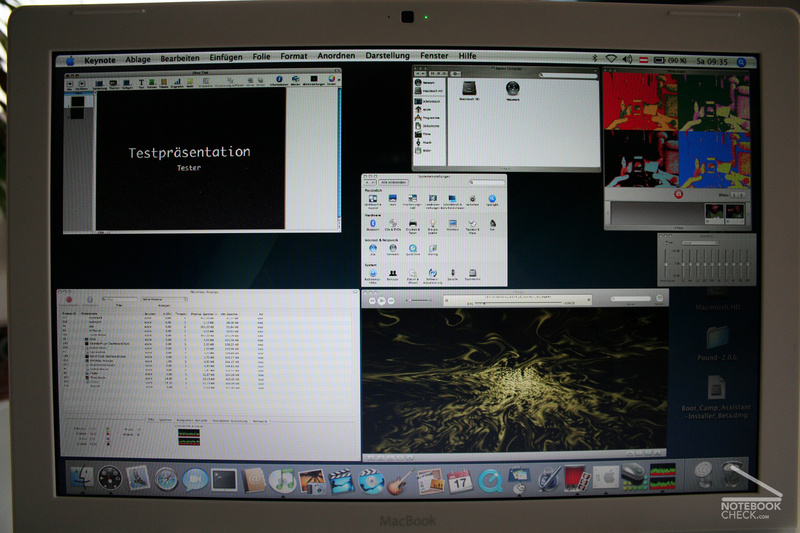 It functioned perfectly and is expecially useful with presentations. The reflecting 13" widescreen display offers a working environment with a pleasant fine resolution of 1280x800 pixel. 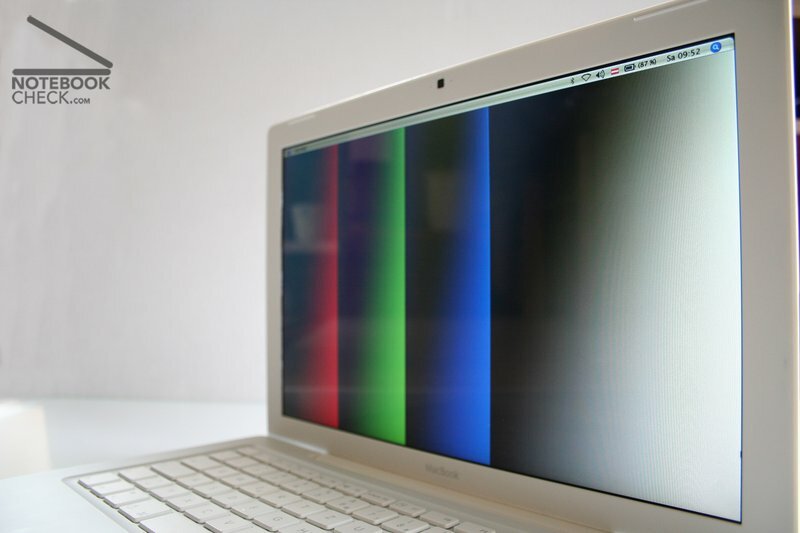 The display brightness, which is on the average 187 cd/m², also allows the usage of the laptop outside in the nature (although in this case reflections of the display disturb noticeable). According to Apple a pole filter is used on the display to avoid reflections. 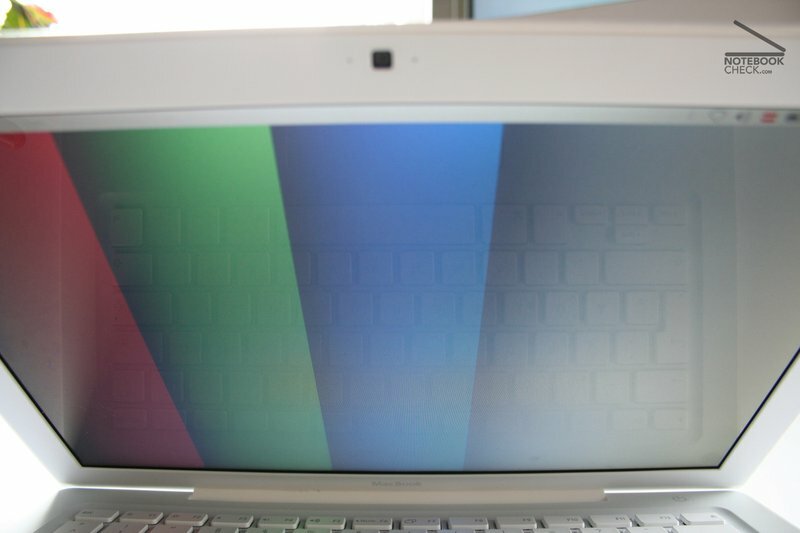 Measured illuminating of 86% is average and the lateral insight range is good, but vertically the display panel loses very fast its colors (see photos below). 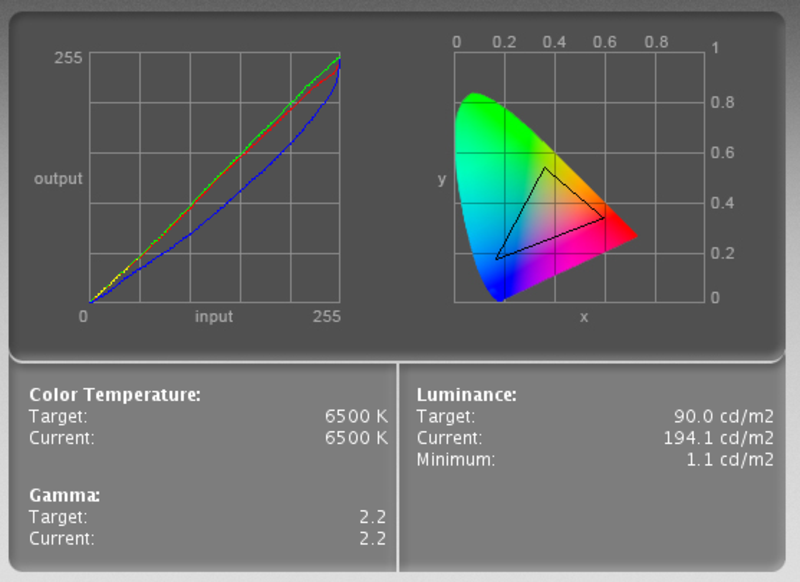 The diagram of the color representation shows a lowered blue curve, which means a warm color representation of the screen. 3 overlaying lines bent in 45° would be ideal (from 0,0,0 to 255.255.255). 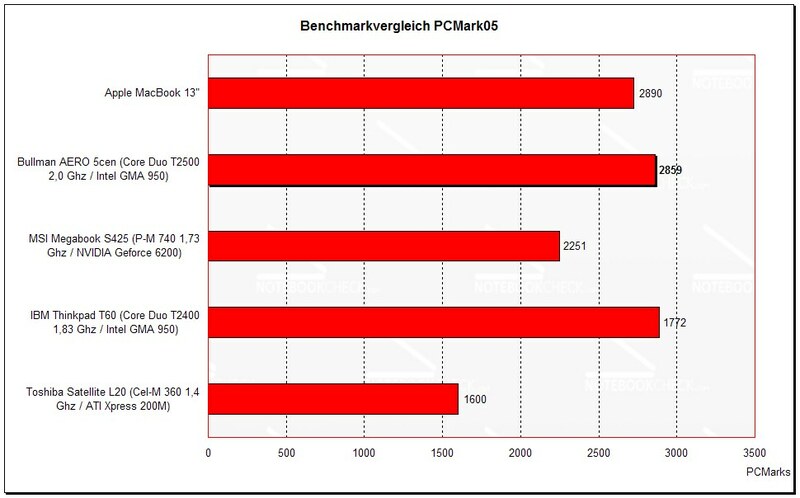 The performance of the MacBook results - as expected - in good office performance with Windows in classical benchmarks. For current games the integrated graphic is not really suitable, nonetheless aged classics like Quake 3 Arena work sufficiently. 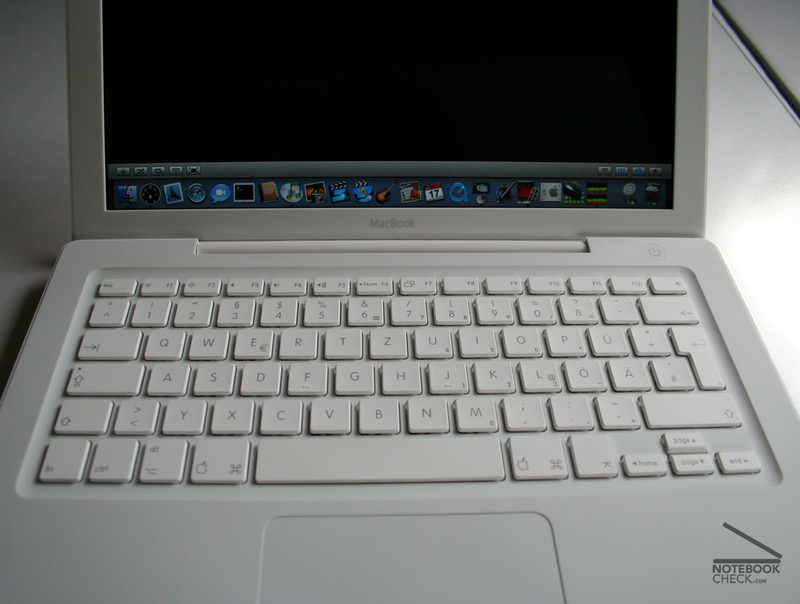 Generally the MacBook performed with Windows like a notebook designed for Windows. No lack of speed could be determined. However there are still some missing drivers. 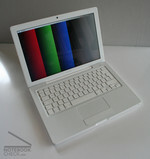 With MacOs X the performance can't be blamed owing to the dual core of processor. 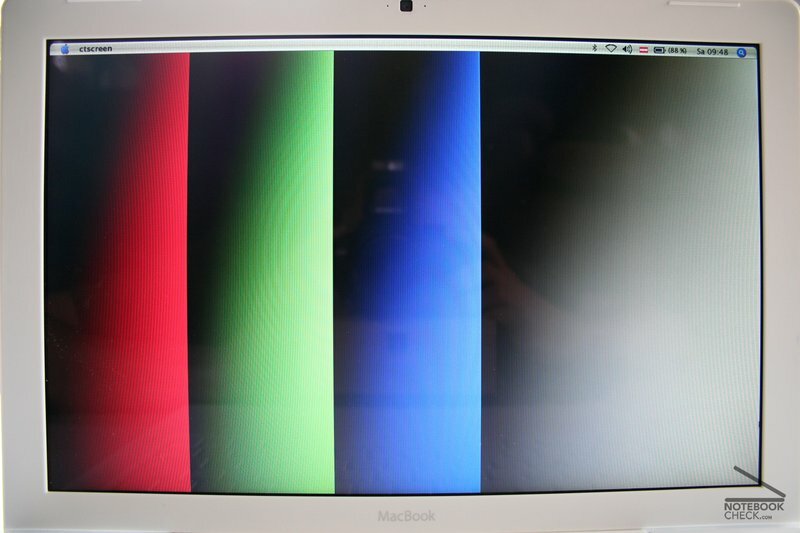 You notice immediately that the MacBook was optimized for MacOS X. Everything works smoothly and fast. Older MacOS programs, which are not yet available in universal Binary (compiled also for Intel), are "translated" automatically by Rosetta, which causes a certain lack of speed, but functions without problems. 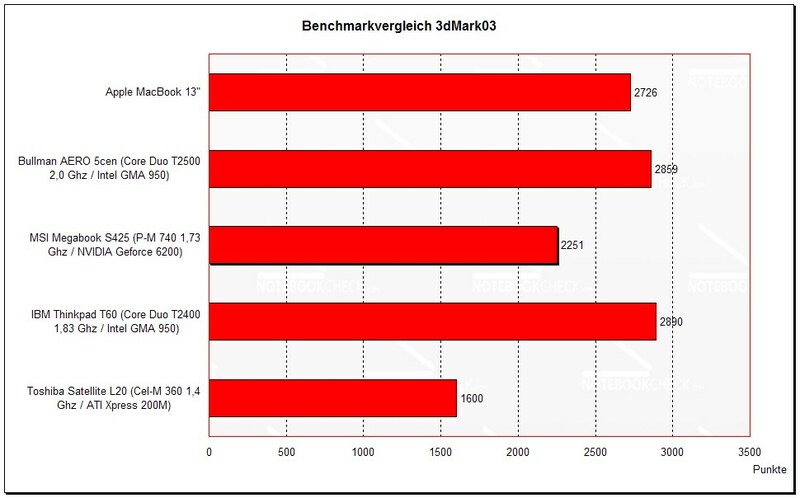 Surprisingly the small MacBook beat the MacBook Pro clearly, although the individual values of the Macbook Pro are usually better (except OpenGL). In OpenGL the ATI Radeon X1600, which is inserted in the MacBook Pro, should beat the integrated Intel graphics clearly. Perhaps there took place a driver update / an operating system update. Without load (internet, text writing) the MacBook remains pleasantly quiet with 30.9 dB. 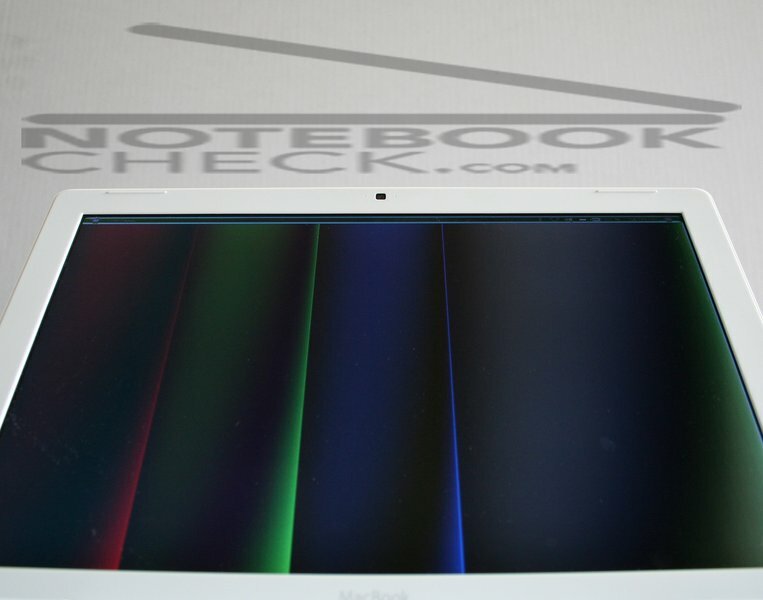 No fan is active and few cm distant in front of the subnotebook quiet noises of the components can be noticed. Only with absolute full load the fan starts to work audible with max 43 dB however not disturbing. The loudspeakers miss any basses owing to their small design. They do not play loud, but clearly and distortion-free. The concept to install them in the rear and let the display reflect the sounds, functions perfectly. Thus it works as if the sound comes from the display. 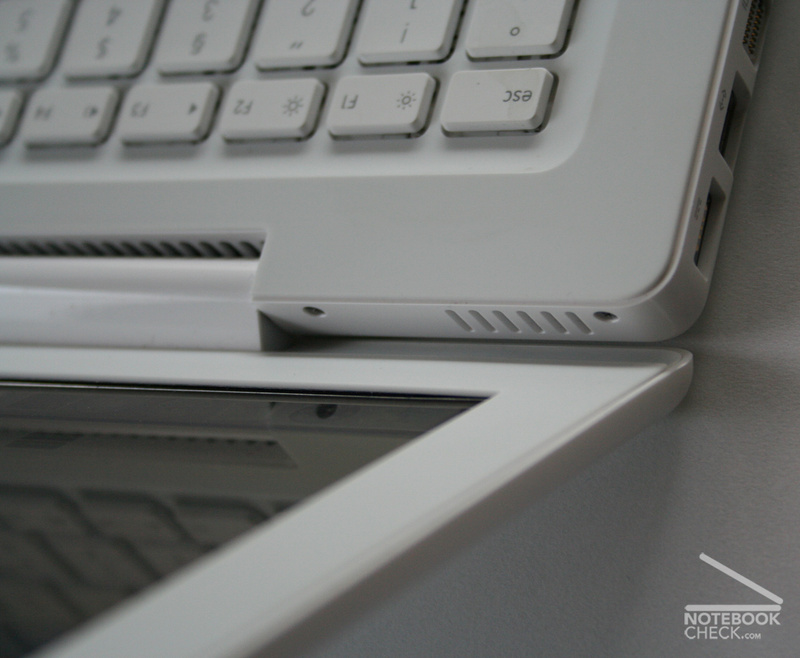 The top side of the MacBook remains quite cool in important areas with max. 30°C. Nonetheless it heats up at the bottom to very hot 48°C . Without load the MacBook had energy for about 4h and 45 min - a good value. During the DVD playback (with max. brightness!) it topped in the test even the 2h 45min indicated by Apple by 10 minutes, praiseworthy! 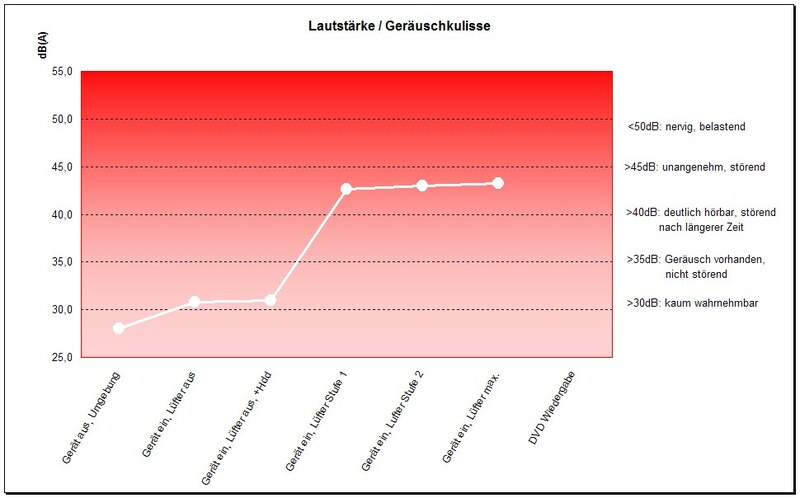 Finally a manufacturer, that does not palliates its data! MacOS X pleases - if you don't want to use any software, which does not exist with MacOS, there is no reason to Windows to transfer. Of course it requires a certain time of habituation for newbees. But since the Apple transferred to Intel processors, there is the possibility of an installation of Windows on the notebooks. For the installation a program called Bootcamp is needed. By means of this tool comfortably a driver CD and a suitable partition for Windows XP are created. In the test this functioned simply and without complications. Unfortunately yet the driver support is not complete and the important components keyboard and the trackpad are supported only rudimentarily (WLAN-, Bluetooth and display brightness short keys, scrolling-function of the touchpad are not available yet). Also for the camera and the keyboard lighting drivers do not exist up to now, whereby both do not function in Windows. The favorable entrance into the Apple world can convince as a rounded off total concept. 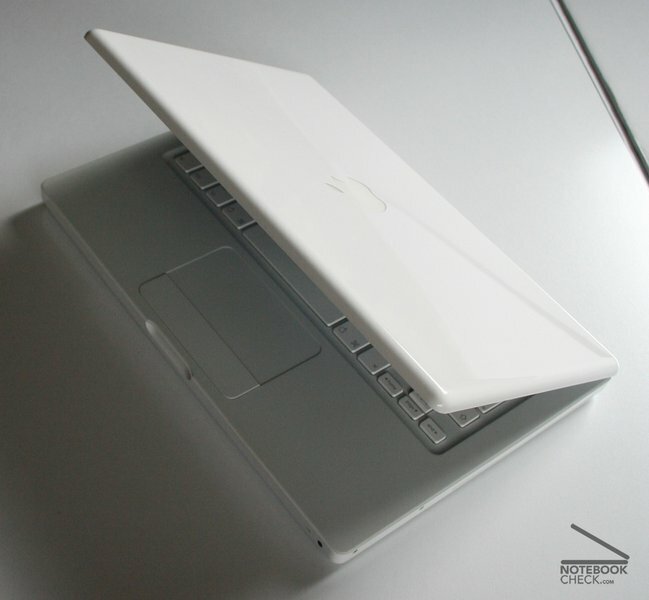 The Design is both technical and optical perfectly realized and simply it makes fun to handle the small MacBook. Only the few USB connections and the reflecting display can be criticized. The performance is very good owing to good components and achieves similar values as the IBM/Lenovo T60. Of course games are (owing to the integrated graphics) not really the best for MacBooks. Users, who want to use Windows exclusively, perhaps should wait for the final version of Bootcamp (is expected with MacOS 10.5.0), since at the moment the input devices are supported insufficiently. With the usage of an external mouse and keyboard hardly any restrictions exist (however this does not make much sense with a Subnotebook). The keyboard can be handled comfortably. The memory is accessable by screws. All interfaces are positioned at the left side. As default MacOS X is installed, which is a serious alternative to Windows. ...beneath the big fan exit, which rarely expels air. 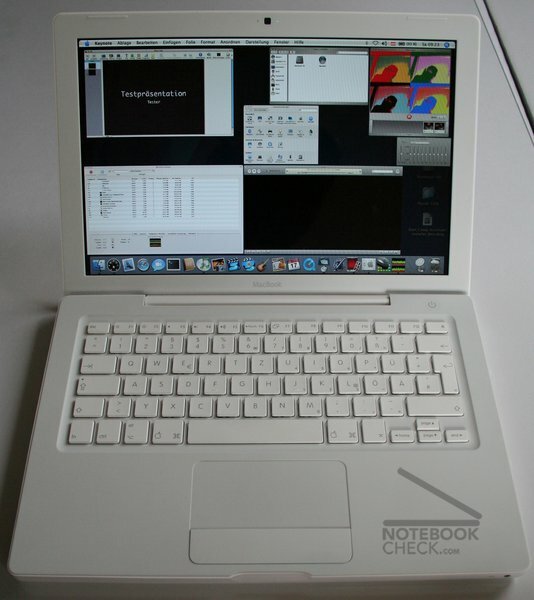 The battery runtime is very good for a subnotebook. 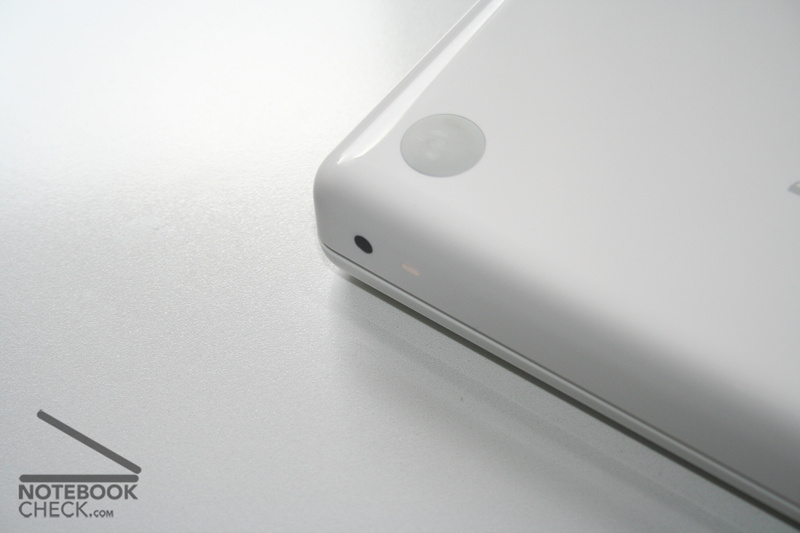 Regrettably the surface is very scratch sensitive (the white case). 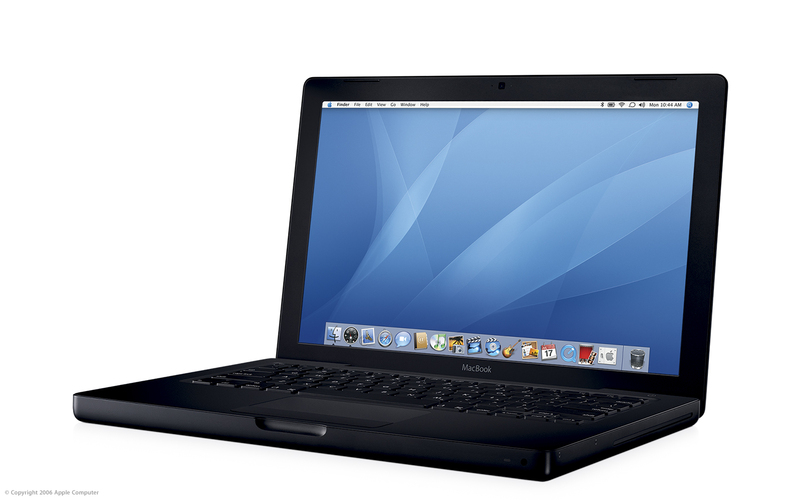 The MacBook also is available in black (top version! ).